How long have you been beekeeping and producing honey? When and how did your interest in beekeeping begin? My grandfather Zinniker kept bees on the Zinniker farm and extracted honey. My father as well as my sister Annette also kept bees. Then, my son Kevin began working a job keeping bees with Fritz Friemoth during the 90s. Shortly thereafter, Kevin moved on to pursue the pluming and heating trades full time, at which point, I took charge of the bees. How did you learn and/or from who? Along with Kevin and Fritz Friemoth sharing their extensive knowledge of beekeeping, I furthered my knowledge through reading, research and generally practicing the art. Where do you get your hives / bees from? Many hives carry over from year to year. I try to propagate from the existing hives. Occasionally, I have to supplement the hives by purchasing bees (from California). Often I prefer to try and split a colony (half with an existing queen). The other half goes to a new box with the right maturity eggs and they will create a new queen. How many hives do you have and where are they? How do you select the locations? 50 hives, 45 produce enough honey for current sales. 5 locations. 1 in Honey Valley (Michael Fields (organic and biodynamic property)), 1 yard in Zinniker farm (biodynamic), 1 at Turtle Valley (CSA garden) Walworth County, Several at Michael Fields’ gardens, lastly 1 large yard in Eagle on 200+ acres of restored wild prairie. The areas I look for are selected by finding a quality and sufficient “pasture” which is where the bees get their nectar and pollen. One of the most difficult things today is to find pasture that is free of chemicals. Talk about your methods…organic/natural, best practices, etc. I think a lot of beekeeping today, relies on artificial pollens, feeding, medications, different chemicals and processes to safeguard the hives and ensure honey production. The moment that I stopped worrying about honey production and really concentrating on the health of the bee is when the honey production really took off. No artificial pollens. Only feed if absolutely necessary…try to leave enough honey for the bees. Others have to feed because the bees didn’t create enough honey to live through the year or they have taken all the honey. Many take honey and feed sugar and the bees cannot stay healthy on sugar. Twice per year (spring and fall), I prepare a tea (made from local herbs / plants) for the bees which help with their digestive system and steps up their immune systems. Generally bees are coming into contact with and consuming contaminants, toxins, modified seed (yields modified pollen) and this amplifies things like mites and generally affects the health of the bee. How do you inspect the hives and what are you looking for? I take a couple deep breaths and see what odor there is. If there is nectar there should be a great sweet scent in the bee yard itself. What is your honey production average? Where is your product sold? Retail? Are there distribution options? Do you make other products (honey based, beeswax, other)? Just honey and beeswax (candles). What concerns to you have about the industry? Commercial beekeepers today, in order to ensure profitability, have to incorporate the act of pollination (moving bees around to pollinate crops). These bees are being fed synthetically (not honey supers) because they’re being moved all over the place. It is creates quite a stress on the bees. Bees are constantly moved around in order to ensure pollination of crops. 60% of all the bees in the US, are taken to California to pollinate almonds in the spring. The bees often will be fighting to pollinate. 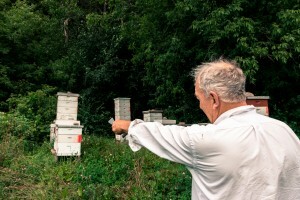 On the positive side, there has been a resurgence of local and hobby beekeepers trying to return to natural processes. What do you see as threats to the bee populations and why is this happening? I am a member of Walworth County Bee Club. I am also a mentor for beekeepers locally and works with interns at Michael Fields Agricultural Institute. Usually, I’ll give a few lectures at Michael Fields or local clubs. Do you do any teaching or mentoring? I have given and am prepared to give at any time, lectures regarding beekeeping. I have given a talk called “Introduction to Beekeeping” in the past. I am open to meeting with anyone to talk about bees, beekeeping and honey production! Describe the most fulfilling part of beekeeping / honey farming? What are your personal goals going forward? I enjoy selling honey wholesale and I wouldn’t mind expanding that a bit. Do you have a target audience / market? My customers are looking for organically, locally produced honey. I sell wholesale to Good Harvest in Pewaukee, 2894 On Main in East Troy and The Teahouse also in East Troy. I also sell the “bear size” container, 1lb, and 2lb volumes. For wholesale, I can do 12lb containers to use in kitchen prep and cooking. Hoping that someday I have grandkids that take an interest!